Patrol-IT Active Dashboard is an active graphic control panel updated directly from the field with real-time data about job related activities for the current working day. The dashboard is continually updated and will always display data from within the last few minutes. The dashboard is designed to be easily customized to your company’s specific needs. Any part of the dashboard can be modified to include only specific and relevant data. It can also be replaced with another chart or report from a rich preset list of both. 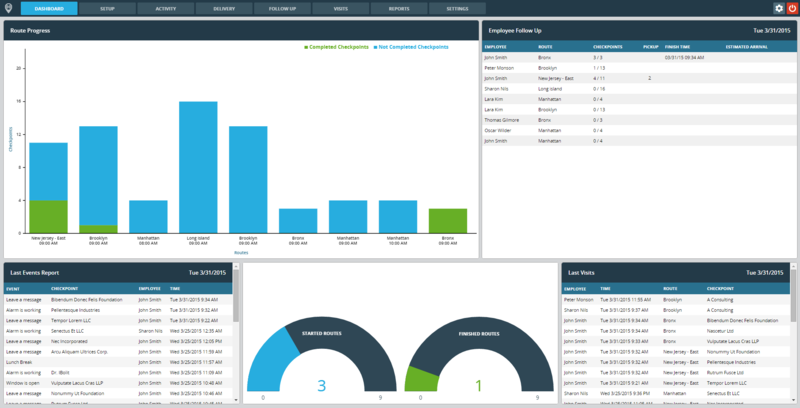 Hence, for each company and separate department, a unique and streamlined dashboard can be easily created. Displays all planned routes, their progress, the total number of checkpoints in each route, and the total number of checkpoints already completed. Displays the latest reported status for each route and employee, their progress, finish time and estimated arrival time. Displays how many planned routes there are and how many have already started. Displays how many planned routes there are and how many have already finished. Displays the last visits performed and any details associated with those visits.